Track file system activity, Active Directory changes, Group Policy changes and server authentications. Audit workstation logons and files copied to USB, email attachments or web browser uploads. CPTRAX for Windows provides real-time alerting and auditing for your Windows and Active Directory environments. CPTRAX is licensed per module, so you only purchase the type of Server auditing you need. Pricing Request a Demo Try CPTRAX Now! Audited activity can be recorded to your Microsoft SQL Server database. Event information can be transferred to your Syslog server. File System activity Who accessed a file? Where did my files go and who deleted/moved them? What files are going off-site? Audit file and folder opens, creates, writes, deletes, renames/moves, and permission/ownership changes. 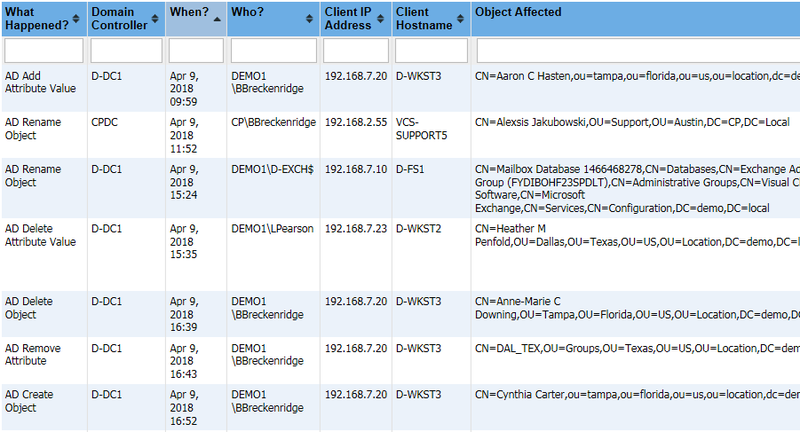 CPTRAX will tell you the user, workstation name, IP address and share used for file activity. Track workstation copies to USB or other removable device and files uploaded via a web browser. CPTRAX will provide who is copying files from a server to a workstation or attaching files to an email even if the action occurred while the workstation is offline. Learn More Request a Demo Try CPTRAX Now! 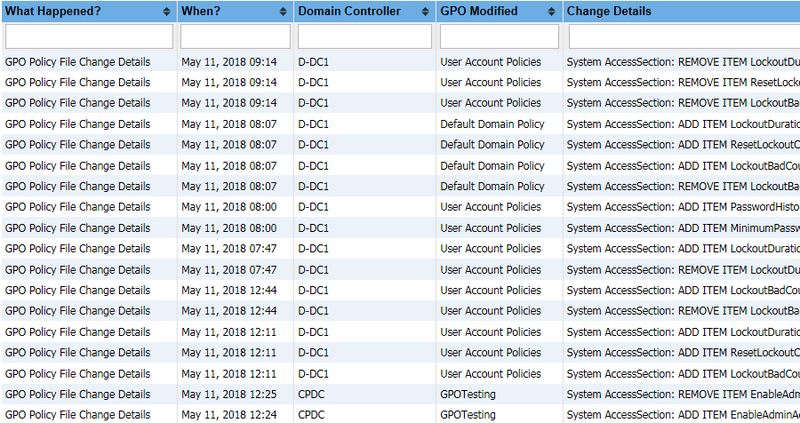 Active Directory changes What users/groups/computers were recently created? Who changed a user attribute? Track and report Active Directory changes by object class and/or attribute within your entire domain or a specific OU. CPTRAX provides the value added, removed, or modified for attribute changes. Rollback single-attribute changes with a few clicks. Who is modifying my Group Policy settings? 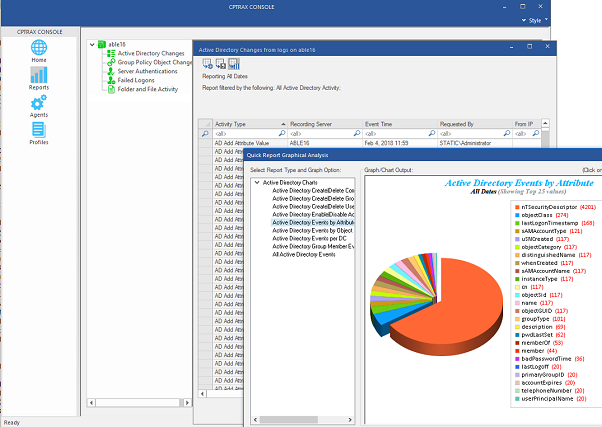 Track creation, deletion, and linking of Group Policy Objects. CPTRAX will also provide before and after values for changes to a GPO's Link Priority, Inheritance, Status, and Version. 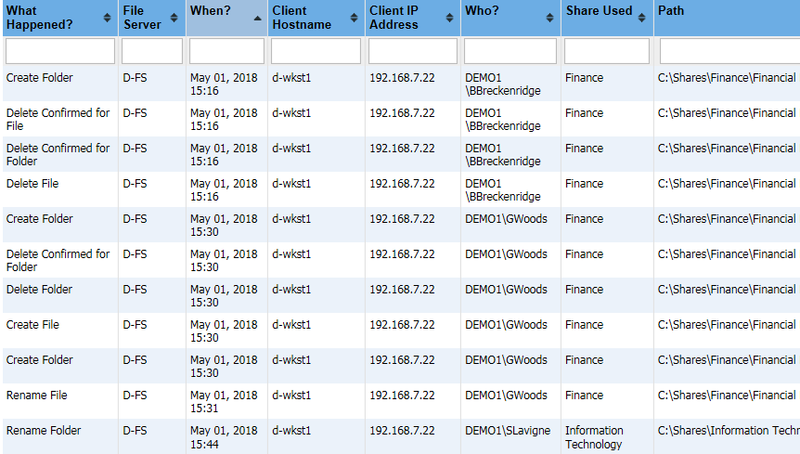 Server Authentications & Workstation Logons Who has logged into Active Directory? When are users logging into their workstations? Which logon attempts have failed? Track and report server authentications by IP range and/or logon name (username). Failed authentication attempts can be tracked and reported by failure type, including bad passwords, expired passwords, bad accounts, and locked/expired/disabled accounts. Track workstation logon/logoff and password change attempts. CPTRAX will provide workstation lock and unlock times, failed password attempts and all password change attempts, even if the action occured while the workstation is offline. CPTRAX for Windows has no minimum CPU speed requirements. Log files are stored locally at the audited server and/or can be transferred to a Log Host server (the Log Host must have the CPTRAX Server Agent installed). Disk space consumption varies considerably depending on the volume of activity. Daily log file sizes can range from 20MB-3000MB. Support for activity records to be sent to Microsoft SQL Server. Support for sending event messages to Syslog servers. The CPTRAX Console is a Windows 32-bit application. Usage of this application requires administrator-level permissions, as well as administrator-level permissions to the servers being audited.